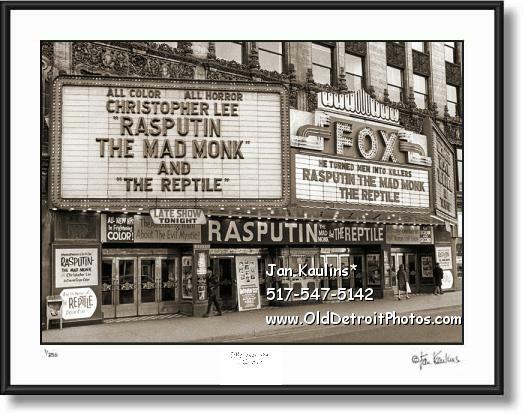 FOX THEATER OLD DETROIT vintage Detroit Fox Movie Theater photo picture print photographs for sale. Vintage Old Historic DETROIT FOX THEATER black and white photo art photography print photograph for sale. This vintage old Detroit FOX THEATRE photo art print has been professionally restored and made into a sepia toned black and white old Fox Theater photo print. The original black and white photo was taken about 45 years ago in the mid 1960's. Since it was restored to its original beauty and become an excellent venue for assorted musical and other contemporary acts, many people might forget when it was just a 'movie theatre', as shown in this historic photo. On the screen marquee were horror flicks--- 'Rasputin the Mad Monk' and 'The Reptile'. The Fox Theatre, designed by C Howard Crane, opened in 1928.